Before the end of our campaign, we have managed to reach our campaign goal of half a million euros. We are thrilled by the Companists' support, and we received positive feedback and interesting suggestions every day. Moreover, through the new feedback tool on Companisto, we have received some questions that we have collected and evaluated. We would thus like to answer your most frequent questions today. We answer individual, non-recurrent questions through individual emails. Our e-scooter models 1953 and 1954L take approx. 3.5 hours to charge for each Kumpan Kraftpaket. Our e-kickboard model 1950 can be recharged within approx. 2 hours. How to Charge the Batteries? 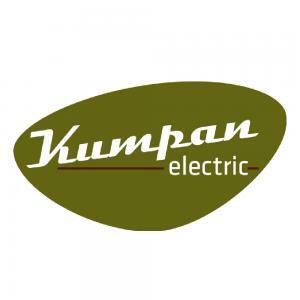 Our Kumpan batteries can be charged at every normal 230-volt power outlet through our charger. You do not need any special outlet to do so, and you can charge the batteries either inside the scooter or outside the scooter. To ride our 1953 and 1954L scooters, you need either a scooter, motorcycle or car license. (EU driver's license class AM, A1, A2, A, or B). You may ride our 1950 e-kickboard and our 1953 and 1954L models as young as at age 15 (as long as they are technically limited to 25 km/h). You then need a moped license or a moped examination certificate. We opened our first Kumpan store in Montreal. This store served as a test for all future Kumpan stores that we will open and as a springboard for our expansion into the U.S. Our global map also shows Shanghai because we opened a branch office there this year. Indeed, Shanghai is a strategically perfect location because it will help us launch Kumpan on the Asian market. We plan to do so within the next three years. Today, our Shanghai office works as a central point of contact for all of our Asian suppliers. In fact, a subsidiary in China is legally necessary for sales in Asia and mandatory for procurement on that continent. We hope our answers have helped you, and we look forward to more fruitful discussions with you in the future. When we launched our Kumpan scooters in 2009, electric mobility was still in its infancy. Back then, some people even made fun of our idea of revolutionizing tomorrow's roads with electric scooters. By now, electric mobility has become widely accepted, and both society and policymakers take it seriously. Recently, the German federal states have launched an initiative aiming to outlaw new gasoline and diesel vehicles by 2030. This is the right way to increase pressure on vehicle manufacturers so that they continue to develop future-proof technology or revolutionize the market through new innovations. As pioneers of electric mobility, we have gained considerable experience and have continuously improved our e-scooters. Our developments in the areas of battery technology and networking make us the innovation leader of our industry. With your support, we want to improve our position on the German market and expand to other countries. Let's shape the roads of tomorrow together! Please invite your friends, acquaintances, and business partners to join the Kumpan family as well. Follow us on social networks like Facebook, Instagram, YouTube, and Twitter and experience the electrical revolution yourself.